Diffusing is amazing in your office, bedroom, or even your car. These areas share one thing in common: they’re all usually pretty small, at least compared to the rest of your house. So what do you do if you want to diffuse in a big area, like a large room or office? I know that some of you I’ve spoken with have a large open floor plan at home or at work, and you’ve had trouble getting complete coverage with your diffuser to all corners of the area. In today’s post, I’d like to talk about different ways you can get the most out of your diffuser and enjoy the benefits of diffusing no matter how big the room you’re in is. One of the most common misconceptions about diffusers is the notion that a larger capacity means that the diffuser will cover a larger area. For example, you’ve probably seen our 100 ML Arise diffuser or our 500 ML iron essential oil diffuser (you might even be lucky enough to own one!). The milliliters refer to the capacity of the ultrasonic diffuser—that is to say, how much water and essential oil it can hold. The capacity of a diffuser actually has very little to do with the amount of space its mist can cover. The capacity is more important when measuring how long the diffuser can run for. The area of coverage is more or less determined by the strength and overall quality of the diffuser itself. Diffusers with larger capacity sometimes tend to have stronger mist, so perhaps that’s where the misconception comes from, but the point is that capacity doesn’t have much to do with how much area the diffuser can cover. For example, the aforementioned 100 ML Arise essential oil diffuser is awesome for small areas like a bedroom or office, but that’s not necessarily because its capacity is less than the 500 ML iron diffuser—the unit itself is just smaller and less powerful (though make no mistake, it excels at what it was made to do). So while it is true that you’ll get more coverage with the larger capacity iron diffuser, that’s not because of the capacity itself. Sorry to drone on about that but it’s important to understand these things, especially if you want to diffuse in a large area. Let’s go ahead and discuss a few ways to do that next. If Your Diffuser Has a “Heavy Mist” Setting, Use It! Most diffusers have a heavy/strong mist setting. If you’re trying to get the maximum coverage that your diffuser can pump out, you’ll definitely want to use it. This will have the side effect of using up your oil a bit more quickly, but when placed in the right area of a large room (let’s say 450 square feet), it can work quite well. Always try to place your diffuser in the center of the room if possible. I’ll talk a bit more about this in the following section, but the gist of it is that when your diffuser is, say, next to a wall, you’re effectively cutting off half of its effective area. If you’re trying to cover an area anywhere from 800 to 1,000 square feet, your best bet is to simply get two diffusers. Despite what some companies say, there just isn’t a diffuser that’s capable of covering that much area by itself. For consistency, it’s best if you use two of the same diffusers. This means you’ll have the same capacity, strength, and look for both. Try to place them as strategically as possible so that they can cover the most area. Don’t put them in corners or near walls, because then the center of the room won’t be covered. Instead, place each one about one third of the way into the room, preferably near the center of the room if possible. That way you’ll get maximum coverage from both units. I’ve been in a couple of large open floor offices that do exactly what I described and it works out really well. As long as you make sure to put the same blend in both diffusers, the entire area will have a very consistent feeling. Speaking of blends, let’s talk about how much oil you should be using to cover large areas with your diffuser next. While we all have our own preference, most of the time diffusers work best when you add 3-6 drops of your favorite essential oil or blend per 100 ML of water. When you’re trying to diffuse in a large area, more oil means a more potent aroma and thus increased coverage. Don’t go overboard though—if you usually use 3 drops per 100 ML, go ahead and bump it up to 5 or 6 and see how it performs in the far ends of the room. Feel free to experiment with the amount of oil you use (as long as you don’t use too much). All oils are a little different from each other, so some experimentation might be in order before you find the perfect amount for your diffuser and room capacity. Remember, the quality of the essential oil you use can make a significant difference on how enjoyable your diffusing is, regardless of whether you’re trying to diffuse in a large room or a small area. Higher quality oil tends to be more potent, so even though it usually costs a bit more than “budget” oils, you’re going to get way more bang for your buck. If you’ve been having trouble getting coverage up to the maximum area of your diffuser, it could be because of the oil you’re using. For more information on how to get the best oils you can, make sure to read our post What to Look For When Buying Essential Oils. We humbly believe that our 500 ML iron metal essential oil diffuser is going to be your best bet for diffusing a large area. These powerful diffusers not only look great, but they have a huge capacity—which means that you can run them all day and night. A single unit will cover roughly 400 square feet. They’re quite a bargain too since they’re on sale at the moment, so if you need to diffuse in a particularly large area (as explained above), it’s very affordable to pick up two of them. We have tons of diffuser recipes scattered around the blog, but if you’re new to diffusing or simply want to learn new ways you can reap the benefits of your essential oils, I’d recommend starting with our post 7 Ways to Rejuvenate Your Mind, Body, & Home With Your Essential Oil Diffuser. You’ll get a ton of ideas and learn more about whether our 500 ML iron essential oil diffuser is the right choice for you. 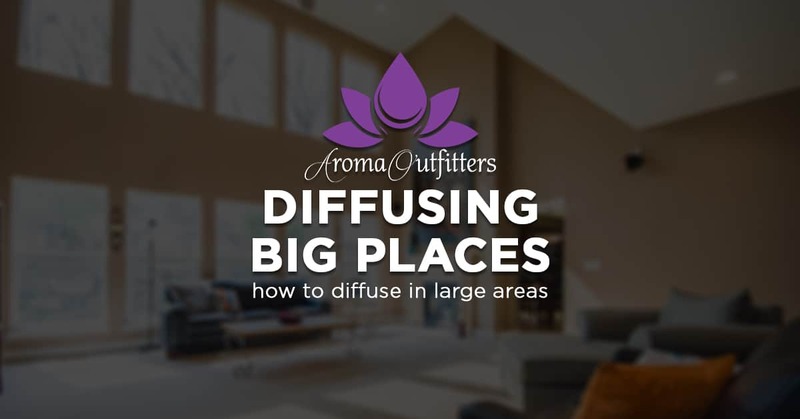 If you’re trying to diffuse in a large area or room, I hope this post was helpful! If you get a chance, come on over and say hi to us on Facebook.